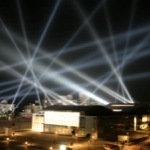 Rafael Lozano-Hemmer - Project "Amodal Suspension"
Amodal Suspension is a large-scale interactive installation where people can send short text messages to each other using a cell phone or web browser. 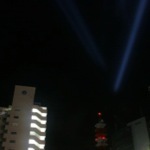 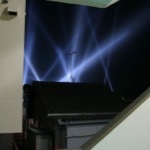 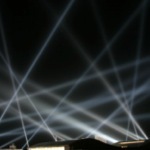 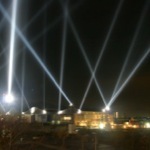 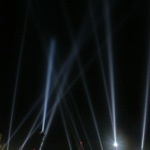 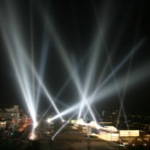 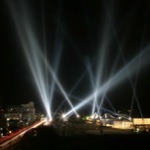 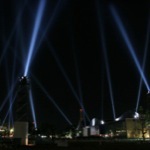 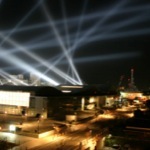 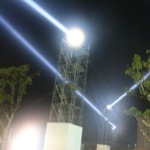 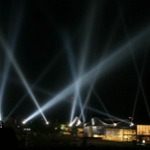 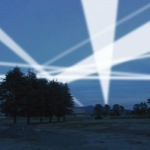 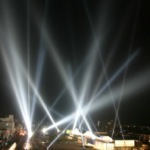 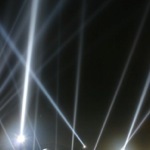 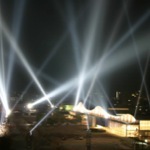 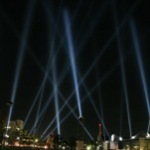 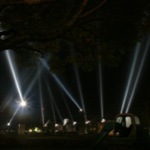 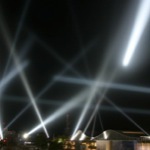 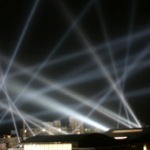 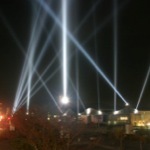 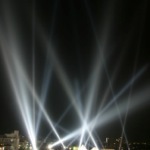 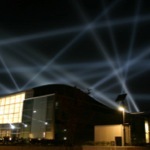 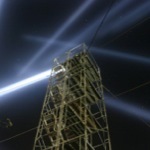 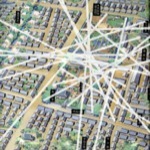 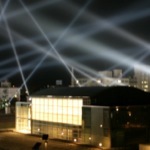 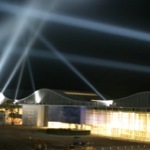 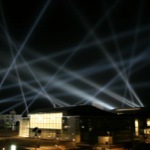 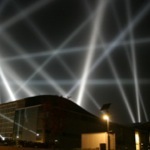 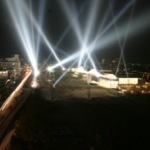 However, rather than being sent directly, the messages are encoded as unique sequences of flashes with twenty robotically-controlled searchlights, not unlike the patterns that make up Morse code. 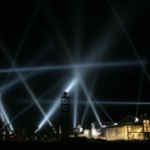 Messages "bounce" around from searchlight to searchlight, turning the sky into a giant switchboard. 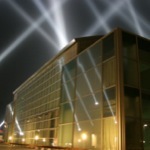 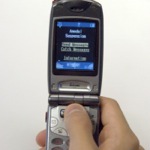 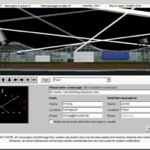 A message may be "caught" with a cell phone or a 3D Internet interface, at which time it is removed from the sky, shown on the cell phone or online interface and projected on the façade of the museum. 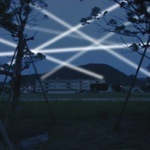 This work was inspired by the Tanabata tradition in Japan whereby short messages are ritually hung on bamboo. 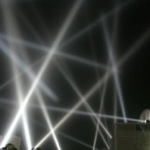 One objective of the piece was to make a public spectacle by using the private medium of text messaging, slowing down communication and introducing the possibility of interception. 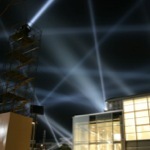 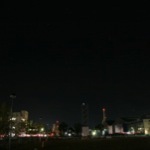 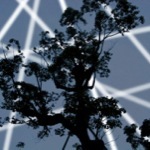 Keywords: database, interactive, outdoor, lights, recorder, robotic, site-specific, print, video, networked, projection. 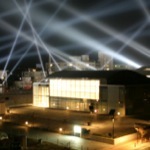 Montluçon Art Mobile, Fond d'Art Moderne et Contemporaine, Montluçon, France, 2019. 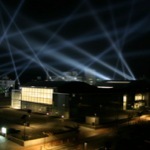 Reincarnation of Art Media, Yamaguchi Center for Arts and Media, Yamaguchi, Japan, 2018. 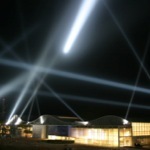 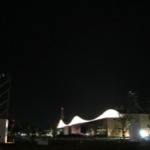 Amodal Suspension, opening project of the Yamaguchi Center for Art and Media, Yamaguchi, Japan, 2003. 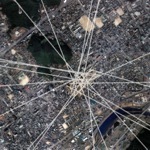 Access Pods and terminals for the piece were installed at: MACBA in Barcelona, MARS Lab in Bonn, C3 in Budapest, Fundación Telefónica in Buenos Aires, MIT MediaLab in Cambridge, Bauhaus in Dessau, IAMAS in Ogaki, ZKM in Karlsruhe, Kyoto Art Center in Kyoto, FACT in Liverpool, Science Museum in London, Ojo Atómico in Madrid, Laboratorio Arte Alameda in Mexico City, SAT in Montréal, Sarai in New Delhi, Eyebeam in New York City, Wood Street Galleries in Pittsburgh, V2_Organisatie in Rotterdam, Itaú Cultural Center in São Paulo, Sendai Mediatheque in Sendai, Art Center Nabi in Seoul, NTT-ICC in Tokyo, MeSci in Tokyo, Ontario Science Centre in Toronto, Emily Carr in Vancouver, WRO Center in Wroclaw and Multimedia Institute in Zagreb.